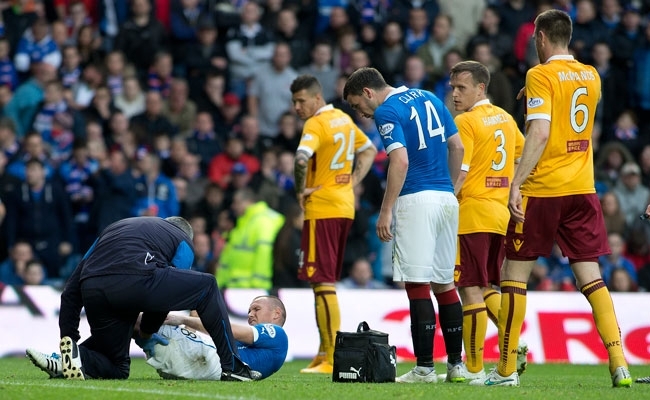 RANGERS hopes of a return to the Premiership were dented by Motherwell as they ran out 3-1 winners at Ibrox. In front of a bumper crowd it was the visiting Steelmen who came out on top after netting twice before the break and then crucially just two minutes after it. 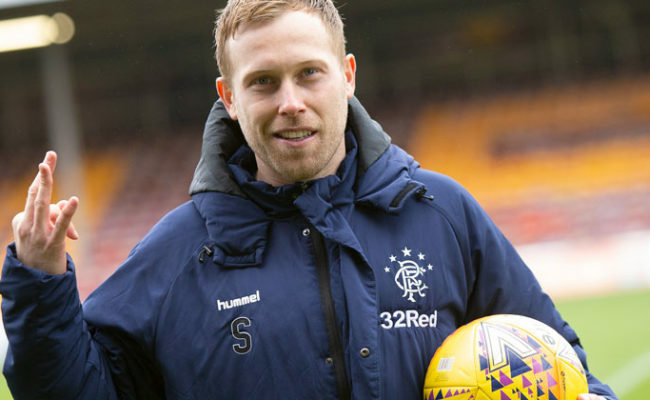 Gers managed to peg one back eight minutes from time through Darren McGregor to set up a frantic final period and give his side a lifeline ahead of the second-leg of the final at Fir Park. It was Rangers who started the brightest as Lee Wallace bombed down the left within eight minutes to reach the by-line. His ball into the box required George Long to stretch at full length and fluttered some Motherwell nerves. But less than a minute later Cammy Bell was forced to smother a dangerous looking cross from Marvin Johnson with runners approaching. The magnitude of the match was being summed up by the fractious nature of the play. As 12 minutes ticked onto the clock Kenny Miller went inches close to opening the scoring when he went it alone to curve a lovely shot just wide of the upright. The striker had room to play with as he ran into space on the edge of the area and lined up the effort with Gers pouring forward in numbers. Eight minutes later Nicky Law nearly netted a crucial goal against his former club but Long reacted quickly to parry the stinging strike clear. Foster had stormed down the right to cut back from the by-line but his pass fell just short. 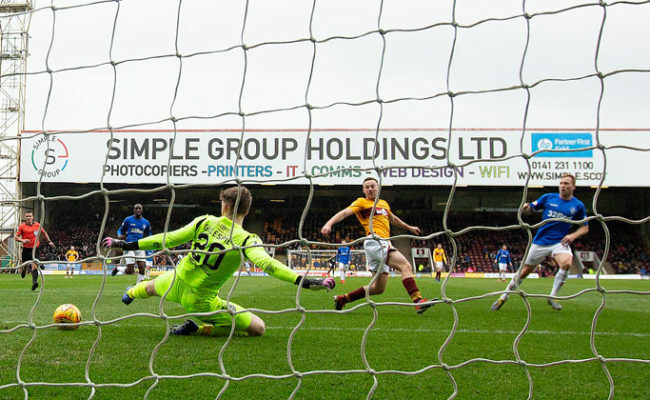 With no Motherwell men jumping onto it the ball filtered through to Law and he weighed up his options before lashing the shot from close range at Long. Despite Rangers looking to be in control it was the Steelmen who had opened the scoring in the 27th minute. Lee Erwin jinked into the box from the right to fire a shot at Bell but it caught McGregor on the way through. The knick caused a change in direction and deflected the ball beyond the keeper who had been waiting to collect the shot easily with cupped hands. The Light Blues went on a desperate hunt for a leveller and on 33 minutes McGregor rose the highest to meet a corner from the right. The centre-half’s bullet of a header sent Long scrambling to get a hand to it at full stretch. And with the ball bobbling around the penalty area Nicky Clark tried his luck from a few yards out but to no avail. At the other end McGregor conceded a free-kick 30 yards out and with a target to hit Motherwell went for their second. After a deft lay off Scott McDonald curled a decent effort at Bell who scampered to push the ball out of play. And with five minutes until the break the visitors did double their lead through Stephen McManus. Lee Wallace gave a poor free-kick away on the right flank and Johnson floated a delivery in. The 32-year-old defender battled to reach it first in the air and nodded into the turf between Bell and his post. With the second-half just minutes old Motherwell dealt another cruel blow to Gers Premiership ambitions through Lionel Ainsworth. Pearson won the ball off Dean Shiels on the half-way line and set off on a mazy run before squaring to the onrushing winger. He slipped into the area to slice a ball, on the angle, into the bottom corner beyond the marooned Bell. 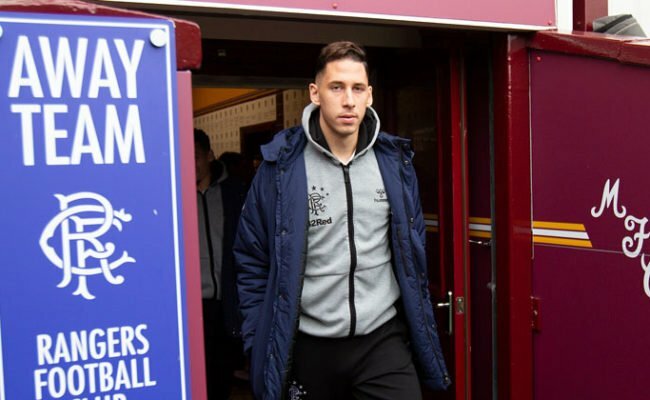 Shiels made way for Tom Walsh within ten minutes of Motherwell’s third and his first act was to whip a ball in for Clark to meet. The diminutive striker headed over and it was to be his last action of the match as Kris Boyd came onto rapturous applause to mix up the Gers frontline. With 25 minutes left to play the away side had a golden chance to give themselves a four goal cushion through Ainsworth. The former Rotherham wide man failed to double his tally though, as he cannoned over from a few yards out with just Bell to beat. It seemed Rangers’ luck wasn’t in when Boyd lingered in the air from Foster’s cross to launch a header at goal. 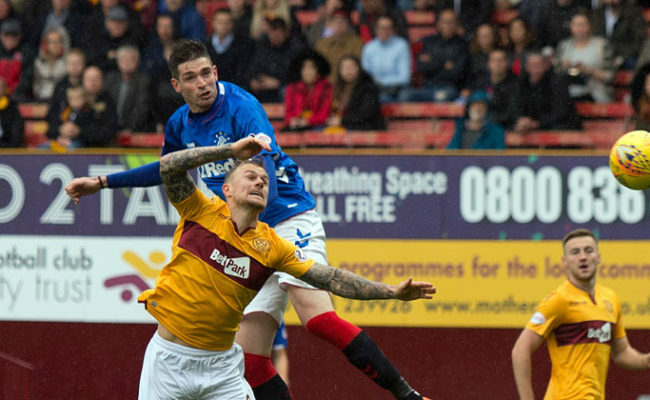 Long was in perfect form as he somehow tipped the ball over in front of a dismayed Gers attack. Stuart McCall’s side needed to score with Ibrox roaring them on and with eight minutes left to play they pegged one back. Law curled a corner in from the right and McGregor was there to power a header past the keeper and send the stadium shaking. The goal served to breathe life into the Gers as they hurried forward to keep the pressure up. Boyd had it in the net with 30 seconds left of normal time but the striker had turned offside and the agony continued for Rangers. Haris Vuckic had been experiencing a quiet game but he nearly made a name for himself in stoppage time when he cracked a shot just wide on the angle. But no Ger could make the crucial difference as the final whistle rang out.